Mayonnaise is an oil-in-water emulsion which can contain up to 80% oil. Gums and thickeners such as starches are used in low fat products to replace the viscosity and bulking effect of the oil, to enhance mouthfeel, and to ensure that a stable emulsion is formed. Large scale production is normally carried out using a specifically designed plant. This process is often semi-automated and usually under vacuum. For R&D, pilot scale and small scale production typical of the “ready-to-use” market - sandwich producers, caterers and other low-volume applications - mayonnaise needs to be produced in a manner which allows much more flexibility, especially when changing formulation. In the first stage of production, the egg, which may be used in either liquid or powder form is dispersed into the water. This acts as the emulsifying agent. Remaining continuous phase ingredients are then added and mixed until dispersed and hydrated. The oil is added as rapidly as the continuous phase will take it up. This results in a dramatic rise in product viscosity as the emulsion is formed. Continuous phase ingredients are only a small proportion of the total formulation, but they perform vital functions. The mixing equipment must be capable of dispersing and hydrating these properly in a relatively low liquid volume. If the egg and other emulsifying agents are not properly dispersed and hydrated the emulsion can break during the oil addition stage. 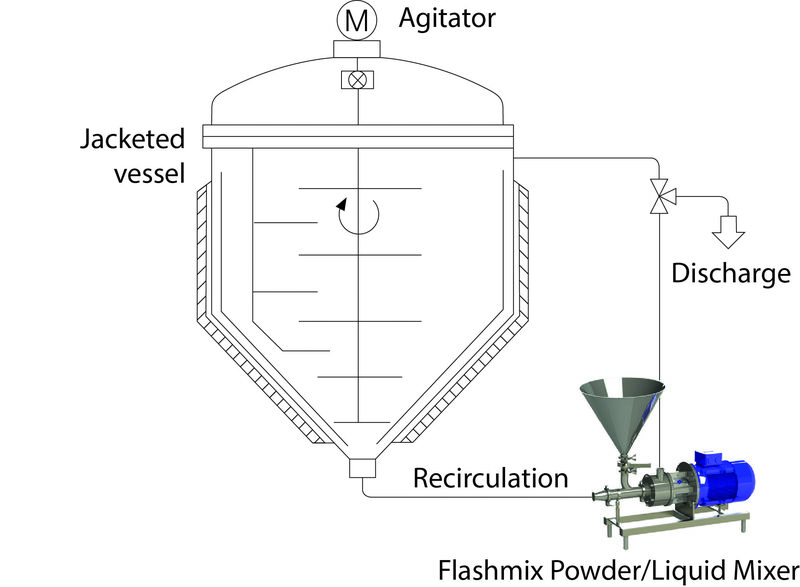 Hydration of stabilisers and thickeners is one of the most difficult mixing operations. The solution may have to be agitated for a long period to complete hydration. Agglomerates can easily form; these cannot be broken down by agitation alone. Due to the high proportion of oil in the recipe the emulsion can break if the oil is not added to the continuous phase correctly. This is very difficult to control when the oil addition is done manually. Oil phase droplets must be reduced to the smallest size possible to maximise the surface area of oil within the continuous phase to ensure a stable emulsion. This is not readily achieved without specialised equipment. Aeration must be minimised or eliminated to maximise product shelf life. 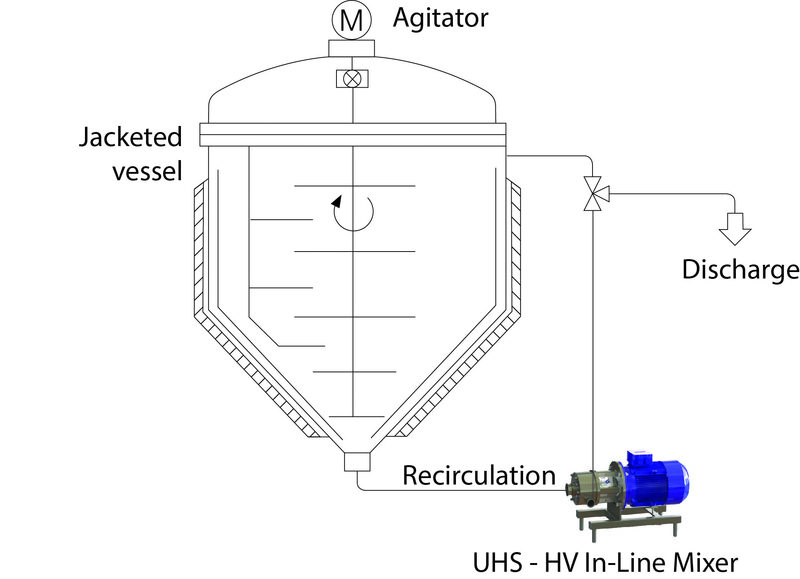 Water is recirculated from the vessel through the system by the specially designed In-Line mixer. The egg (either powder or liquid) is added to the vessel and is rapidly wetted out and dispersed into the high velocity liquid stream. The remaining aqueous phase ingredients are then added to the vessel. Recirculation continues until the ingredients are fully dispersed and hydrated. The oil feed valve is opened and oil is drawn from the hopper into the aqueous phase at a controlled rate. The aqueous and oil phase ingredients pass directly into the workhead of the In-Line mixer where they are subjected to intense high shear. This finely disperses the oil into the aqueous phase, immediately forming an emulsion. The vinegar (and/or lemon juice) is added with the last of the oil. Recirculation of the product continues to ensure a uniform consistency as the viscosity rises. After a short recirculation period the process is completed and the finished product is discharged. Ideal for small batches that are intended for immediate use. The system practically eliminates operator error. Offers the batch-to-batch consistency and stability of mayonnaise manufactured in turnkey plant without the high capital expenditure. Yield of raw materials is maximised, as thickening agents are fully hydrated and other ingredients are correctly dispersed. The system is designed for handling high viscosity products without the need for additional pumps or auxiliary equipment.